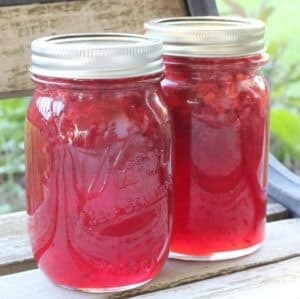 June 20, 2018 4 comments on "Canning Strawberry Lemonade Jam"
I have tried a lot of different jam recipes in the past couple of years. So far the all-time favorite has been apple pie jam. However, I have to say that this recipe for canning strawberry lemonade jam may be a new favorite. 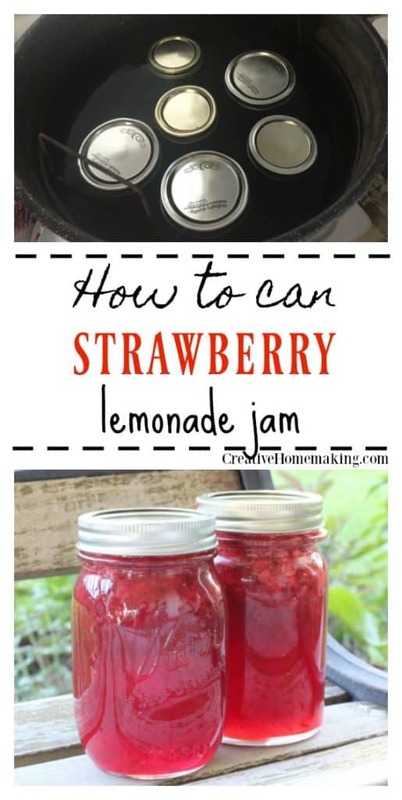 It is one of my favorite recipes for canning strawberries. Strawberry lemonade jam is basically just strawberry jam with extra lemon juice added. It is really good, and very easy to make. The original recipe calls for fresh lemon juice, but I used bottled lemon juice and it turned out great, so you can use either one. (Most canning recipes call for bottled lemon juice anyway because it has a more consistent acidity level then fresh lemons). This recipe makes approximately 3 pint jars or 6 half pints. Are you new to boiling water canning and want to watch me prepare this recipe step by step? 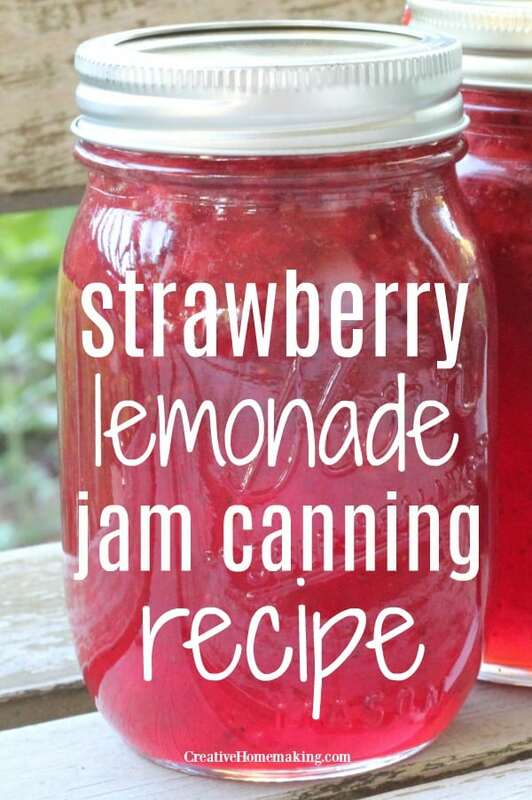 This video will show you that canning strawberry lemonade jam really is easy! Trying to convert strawberry measurements? Take a look at my strawberry equivalents. Wash and sterilize your canning jars, lids, and screw bands. The easiest way to sterilize them is to run them through the sanitize cycle in the dishwasher and remove them from the dishwasher to use when they are still hot. To prepare the fruit, crush the strawberries with a potato masher. You need 4 cups of crushed strawberries for this recipe. Put the strawberries, lemon juice, and lemon zest together in a large sauce pan. Stir in the pectin. Bring to a rolling boil that cannot be stirred down. Stir in sugar. Add 1 tsp. margarine or butter to reduce foaming, if desired. Quickly ladle fruit into prepared canning jars, within 1/8 inch from the tops of the jars. You can actually measure the head space right on this canning funnel. Wipe the rims of the jars with a damp cloth. Place canning lids and screw bands on the jars. Remove jars from canner and place upright on a towel on the kitchen counter to cool completely. Do not disturb the jars for at least 12 hours. After jars are cool, check seals by pressing middle of lid with finger. If lid springs back the lid is not sealed. Unsealed jars can be placed in refrigerator to be eaten in the next couple weeks. Sealed jars can be stored for at least 1 year. 4 Comments on "Canning Strawberry Lemonade Jam"
What size package of pectin did you use? Based on the sugar I am guessing the 1.75 oz., rather than the 2 oz. Yes, the package of pectin for this recipe should be 1.75 oz. Sounds delicious but I am diabetic. Could I use Splenda in place of the sugar? 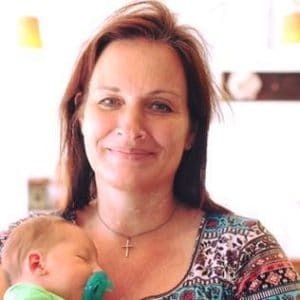 Hi Debbie, Splenda can’t be used with regular pectin. There is a pectin you can buy that is for low sugar or no sugar jams. I haven’t tried it, but you should be able to make this same recipe with the no sugar pectin, and then add the splenda to sweeten it (although you can leave it out entirely if you want).